It’s no secret that I’m fond of folk and country songs adapted to jazz and dance arrangements (see Casey Jones, Hand Me Down My Walkin’ Cane/She’ll Be Comin’ Around the Mountain, another Casey Jones), and this new arrival to my collection fits squarely in that mold. I’ve always found the material on many of these early issues of Melotone records interesting, and looking through the discography, a few records by “‘Happy’ Dixon’s Clod Hoppers” particularly intrigued me. Was it a country band or a dance band playing country music a la Paul Tremaine (as was apparently a passing fad around 1930). No transfers of any of their records seemed to be available, and little information on the group seemed to exist, so I’d been keeping an eye out for one of their for quite a while. This copy having fallen into my possession, I’m happy to finally be able to hear it, and now all of you can too. Melotone M 12057 was recorded on October 27, 1930 in New York City by “Happy” Dixon’s Clod Hoppers, actually a pseudonym for Harry Reser’s Six Jumping Jacks with vocals by Tom Stacks, and most likely with Bill Wirges at the piano. The first side is a fine fox trot rendition of the pseudo cowboy ballad “When the Bloom is On the Sage”, punctuated with Harry Reser’s famous banjo and an accordion near the end lends a Western touch. 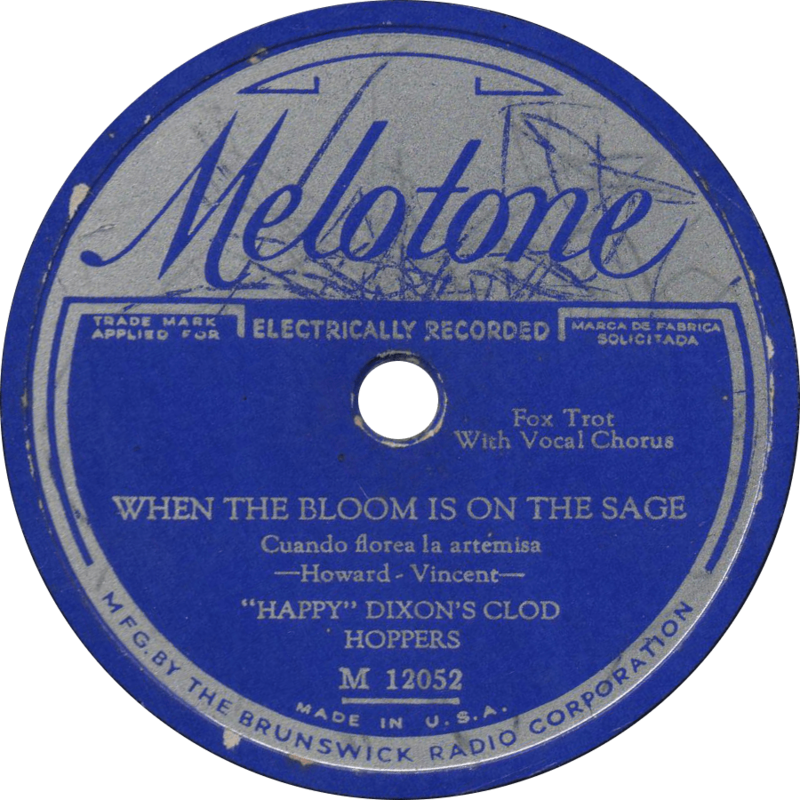 When the Bloom is On the Sage, recorded October 27, 1930 by “Happy” Dixon’s Clod Hoppers. The flip-side is a little hotter, with a fast paced novelty arrangement of Henry Whitter’s famous “The Wreck on the Southern Old 97”, made popular by Vernon Dalhart in 1924. In this version, specific reference is made to “Steve” Broady, the engineer of the Southern Railway 1102 pulling the Old 97 “Fast Mail” when it departed Monroe, Virginia on September 27, 1903, bound for Spencer, North Carolina. As the song tells, the Old 97 never made it to Spencer, derailing on a trestle near Danville, Virginia as a result of Engine 1102’s excessive speed. Unlike Steve Broady, Engine 1102 survived the accident, and was still in service when this side was recorded in 1930. 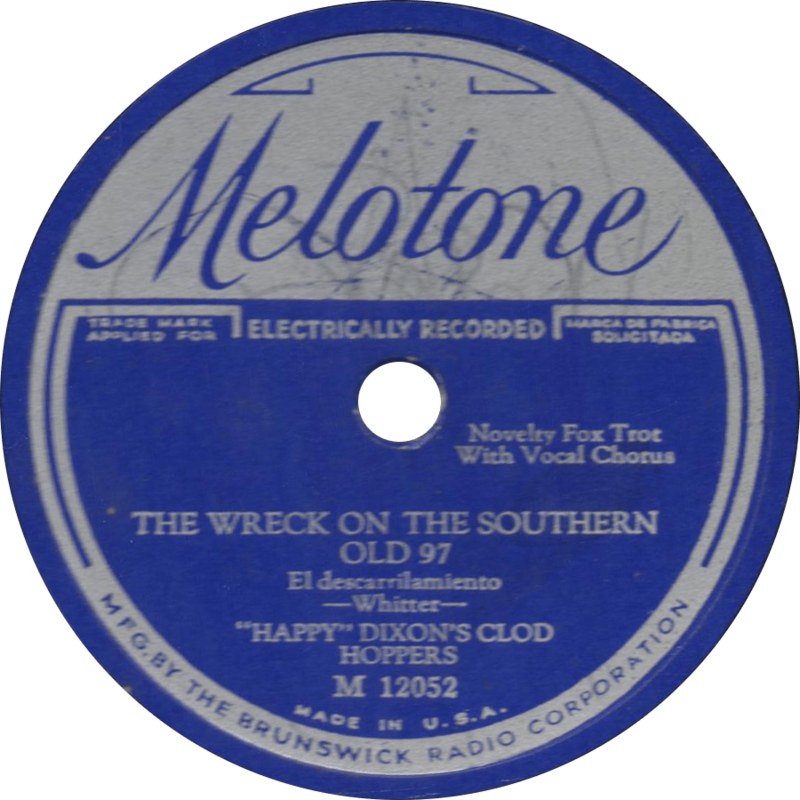 The Wreck On the Southern Old 97, recorded October 27, 1930 by “Happy” Dixon’s Clod Hoppers. This entry was posted in Records and tagged 1930, 1930s, Brunswick, Harry Reser, Jazz, Melotone, New York, Popular, Tom Stacks, William F. Wirges by R. Connor Montgomery. Bookmark the permalink.